Sheryl Rowling, CPA, is head of rebalancing solutions for Morningstar. In this role, she focuses on tax-efficient portfolio management strategies for Morningstar’s Total Rebalance Expert (tRx) software and serves as a subject-matter expert on tax-efficient investing, portfolio rebalancing, and advisor practice management. Rowling has nearly 40 years of experience in the financial services industry. In addition to her role at Morningstar, she is the principal of Rowling & Associates, an investment advisory firm. 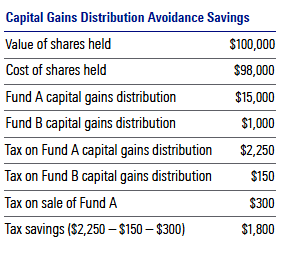 Capital gains distributions occur near year-end when mutual funds need to pass through gains realized within the funds. This means that shareholders have to pay tax on income they haven’t received. It’s true that the basis gets increased, but clients typically don’t like paying taxes on phantom income. As the year comes to a close, we’ll see firms publish preliminary estimates of distributions. In most cases, these distributions won’t be material. However, advisors should be on the lookout for large distributions from actively managed funds. Many actively managed funds have experienced outflows, which forced managers to sell appreciated securities to pay for liquidations. This triggers gains that, in turn, are spread across a smaller shareholder base. According to Christine Benz, Morningstar’s director of personal finance, “Year-end 2018 is likely to be yet another in a string of lousy years for mutual funds capital gains distributions.” Several fund companies have released estimates, and some are higher than 10% of net asset value. At a minimum, advisors should warn clients of what to expect. For those wanting to be a hero, steps can be taken to avoid these distributions. 1. Determine which funds estimate high capital gains distributions. One way to do so is to search each fund company’s website. A better option is to use a website that consolidates this information. CapGainsValet, managed by Mark Wilson, APA, CFP, provides links to capital gains distribution estimates on roughly 70% of all mutual fund assets. There is a limited free search function, but for a minimal one-time fee, the “pro search” expands the database to more than 250 mutual fund families and the largest providers of exchange-traded funds. It also includes preliminary distribution information to better support year-end planning. My favorite part of the site is the “Doghouse list”—funds with estimated distributions of more than 20% of net asset value. Mutual Fund Observer provides links to mutual funds capital gains estimates as they become available. BlackRock Advisor Center has a tax estimator for professionals that will calculate estimated capital gains distributions—as well as tax consequences—for entire portfolios. The site accepts spreadsheet uploads or fund tickers and position sizes that can be entered individually. 2. Select an alternate fund or ETF to substitute for the high-distributing fund before the fund posts its distributions. Typically, there will only be a few funds for which no replacement is suitable. The replacement should have lower or no estimated distributions and be acceptable for long-term holding (in case of appreciation). 3. Determine which clients hold material positions in the high-distributing fund within taxable accounts. It’s probably not worth the trading costs to save just a few bucks. 4. Sell and replace shares of the high-distributing fund in cases where the savings is material. This necessitates determining the savings from lowering the dividend recognition net of potential recognition of gains (or losses) on the sales. Tax on estimated capital gains distributions for the current fund – tax on estimated capital gains distributions for replacement fund + tax savings from sale of current fund at a loss – tax on sale of current fund at a gain = tax savings from capital gains distribution avoidance. In this case, a $1,800 net tax savings would certainly be material compared to trading costs. Although capital gains distribution avoidance is possible without automation, rebalancing software like Morningstar’s Total Rebalance Expert, or TRX, has functionality specific to this purpose. By simply entering information on the distributing fund and replacement fund, TRX will automatically produce trade files when net savings exceeds a dollar amount specified by the advisor. 1. It cuts down on taxes, and clients hate paying taxes. 2. It’s a way of adding performance “alpha” risk-free. Whether you automate or use low-tech methods, your efforts will be appreciated by your clients.